Talk to the World with Amateur Radio! A bookmark on one side and ruler on the other. 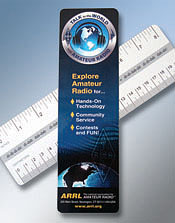 The bookmark features a colorful design with the words Explore Amateur Radio for...Hands-On Technology, Community Service, Contests and FUN! The ruler contains a fun message in Morse code. A great recruitment tool for scouts and young hams. Size 8.5" x 2.5".